This year, there will be many more than 10 times as many photographs taken than in 1992, and yet Kodak is bankrupt. More news is being generated on a daily basis than ever, and yet the Los Angeles Times is bankrupt, The New York Times' debt sits at junk status. Americans are watching more movies at home than ever, and now rent more movies than they purchase, and yet the curtain has closed on Blockbuster. Book sales increased 27% in 2011 in the U.S., and yet Borders Books collapsed. It's too easy to dismiss these dislocations in photos, newspapers, video rentals and books as germane only to those industries, or to blame managers who did not 'get it,' or to point to the digitization of the end-product in those sectors. Obviously, those are contributing factors. However, they distract us from the larger point that the industrial model 'winners' crumbled under their own weight, with business models that no longer fit the new digital realities of their markets. Very plainly, if you have not built key portions of your business on the principles and realities of an emerging computing model -- the social, mobile, analytics and cloud information technology stack, or 'SMAC stack' for short then you are at risk of being usurped by those competitors that have. The benefits of the CLOUD are well documented -- on demand with nil cap-ex, flexibility of anytime anywhere any device access, real time collaboration and a single source of data, auto backup etc. are well documented. Add to these obvious advantages the compounding effect of SMA -- social, mobile and analytics and your business gets a real competitive edge. The Value Chain: 'Unchained' by Social Technologies The impact of this new technology stack on the corporation is currently being under-hyped. SMAC stack technologies are not simply being 'glued onto' the traditional corporate model; in many cases, they are creating an entirely new model. In the same manner that steam power, steel and electricity provided the platform for the industrial corporate model, the SMAC stack is providing the foundation for the knowledge corporate model. This envisioned future, in many ways, is already here. Take, for instance, how Craigslist has transformed newspaper classified ads. As recently as 10 years ago, classified ads represented one of the primary revenue streams for newspapers in the U.S., generating $19.6 billion in revenues in 2000. By 2012, that figure has dropped to less than $5 billion. Where did many of those classified ads go? To Craigslist, where each month, more than 80 million new classifieds are posted, to an audience of more than 50 million unique visitors. And this is all managed by a grand total of 32 people in the Craigslist headquarters in San Francisco. For decades, newspapers had managed this information-intensive activity as an industrial process, with the very expensive colocation of people, process and tools. This industrial process was replicated (redundantly) at hundreds of newspapers across the country, employing tens of thousands of people across local markets ... and it was eviscerated in just a few years by a few dozen people with origins in a different industry. By no means is this story isolated to newspapers. Another example of the efficiency and disruption of a business model based on the SMAC stack is highlighted by the metrics of 11-year-old Wikipedia vs. 244-year-old Encyclopedia Britannica. 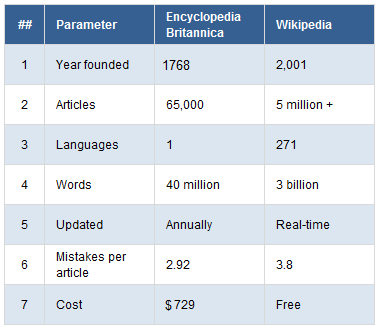 The figure below reveals the incredible scale advantages of the SMAC-stack powered Wikipedia. Small wonder that Encyclopedia Britannica published its last physical version in early 2012. Craigslist and Wikipedia stand as extreme, yet simple, examples of dematerialization: the process by which material-based value chains go virtual. This unbundling or dematerialization of knowledge processes is at the heart of many industry transformations. The figure below highlights the significant displacement occurring as a result of the proper implementation of SMAC stack technologies. In every case, the industrial model (or widget) winners held significant advantages in brand awareness, customer relationships, distribution channels, research and development capabilities, management experience, employee depth, balance sheets and market valuation. Yet, the digit winners possessed one key advantage: Their value chains were in harmony with the realities of today's information-based markets, because they had mastered the SMAC stack technologies. 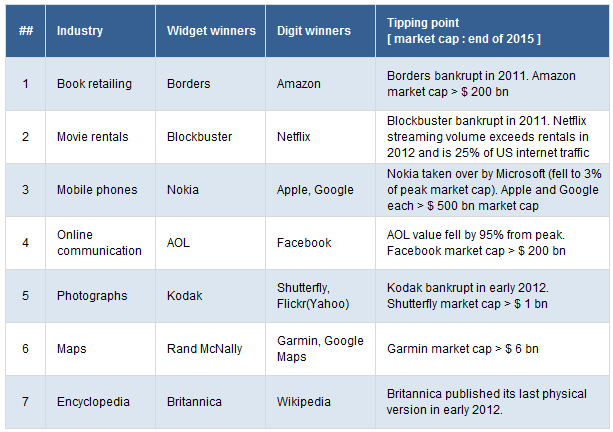 By 2012, they had all triumphed, pushing widget 'champions' to either bankruptcy or market valuations 90% off their peaks. In hindsight, the fight wasn't even fair. What's going on today is not the digitization of products, but the digitization (and resulting virtualization) of entire business models. In this new landscape, it doesn't matter how hard your organization works, how well you manage or what resources are at your disposal; if you are competing with an antiquated business model, you are at risk of facing your own Kodak moment. Denial in industrial-age firms can be palpable, even in the most informed organizations. As stated by George Jones, CEO of Borders Group in 2008: 'What I found most compelling was the Borders brand and the people. Borders is a much loved, highly regarded brand with some of the most intelligent and engaged employees I have worked with in the retail industry.' Fewer than four years later, Borders was out of business. It got SMACked. 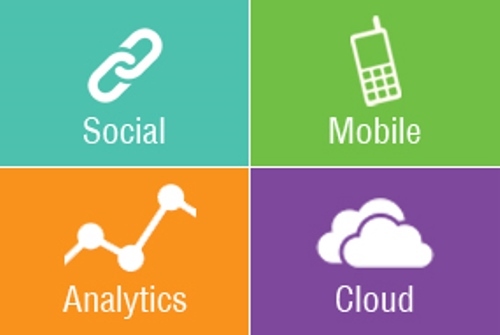 Technology: Harness the multiplying effect of the SMAC stack to transform your business. Business Models: 'Unchain' your industrial value chain by creating boundary-less ways of working within your organization and with business partners and customers. Get SOCIAL. Focal Points: Identify key knowledge process areas where the confluence of new technologies and ways of working can truly differentiate your business. 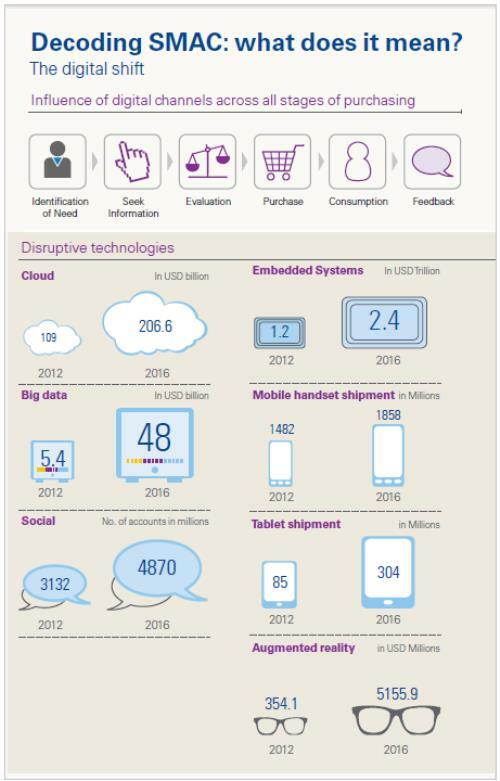 By 2015, we will have roughly 10 billion computing devices in use, generating 1,800 exabytes of data. (Yes, we will soon cross the line where there are more computers on earth than people. If this number seems overstated to you, simply take inventory of the smartphones, tablets, PCs and gaming consoles in your home ... then take inventory of your work-related devices.) 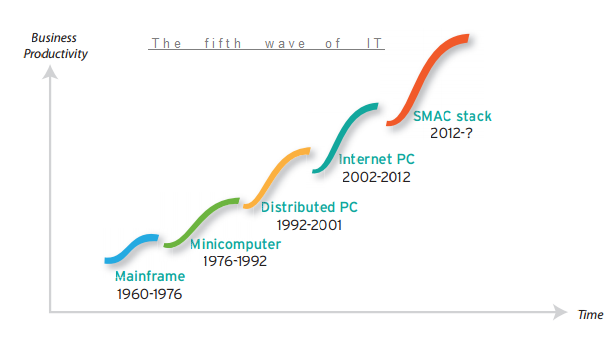 The number of computers has been largely driven by human usage, with dramatic growth at each layer of the SMAC stack. In particular, the growth in mobility and data highlights the need to focus on these two areas in the near term. MOBILE : 'The smartphone in your pocket has more computing power than all of NASA did when it put a man on the moon in 1969.' And yet all you do is play video games. Seriously, when it comes to mobile adoption, we are very close to full market saturation. In 2012, mobile network data will exceed fixed network data for the first time. 45 billion mobile apps will be downloaded in 2012, and it is predicted over 200 billion will be downloaded in 2015. Mobile apps will grow from a $6 billion industry today to a $55.7 billion industry by 2015. Mobile unit sales are now more than double those of PCs, and mobile device revenue has also surpassed PC revenues. The number of smartphone shipments is expected to be one billion in 2016. After its first weekend on the market in September 2012, the iPhone 5 sold 5 million units. From May to December 2011, the number of Android Market apps doubled to more than 400,000 apps. Globally, mobile data traffic will increase 18-fold between 2011 and 2016, reaching 10.8 Exabyte per month by 2016. Global mobile data traffic will grow three times faster than fixed IP traffic from 2011 to 2016. Global mobile data traffic was 2% of total IP traffic in 2011, and it will be 10% of total IP traffic in 2016. By any statistic or definition, it's now a MOBILE world. The question is, where will it lead us, or where will we lead it? This explosion of data is being driven by the SMAC stack in two stages. First, with the growth of mobile devices and social networks, your systems are constantly being hit by suppliers, customers and employees across your entire value chain, and they are talking openly about your company, in an 'anytime, anywhere' fashion. This alone will lead to a five-time growth in data. Its a mobile world also in the emerging markets. Mobile connectivity in India is exponential. 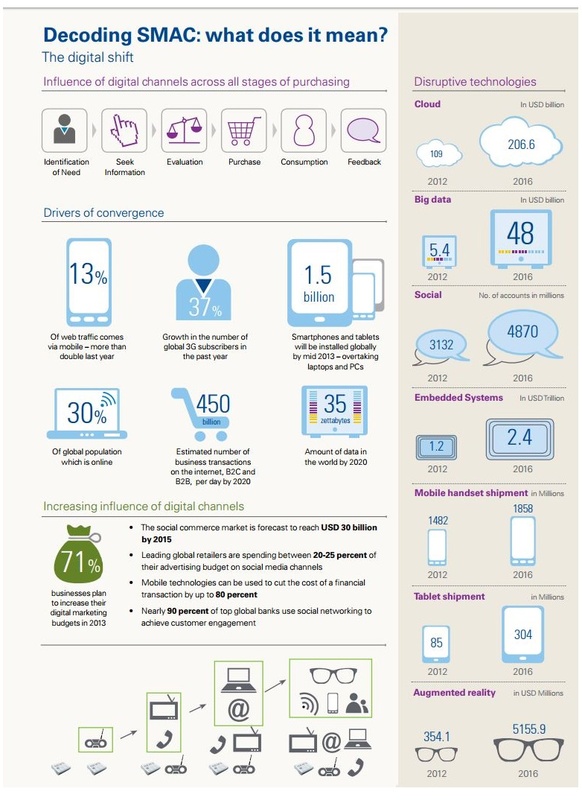 The Ericsson mobility report (India appendix June 2015) -- states that India will have reached 100% mobile connectivity by 2020 and will have more mobile devices (1.4 bn / 140 crores) than the population of India. And the vast majority of these will be smartphones with 3G / LTE connections. 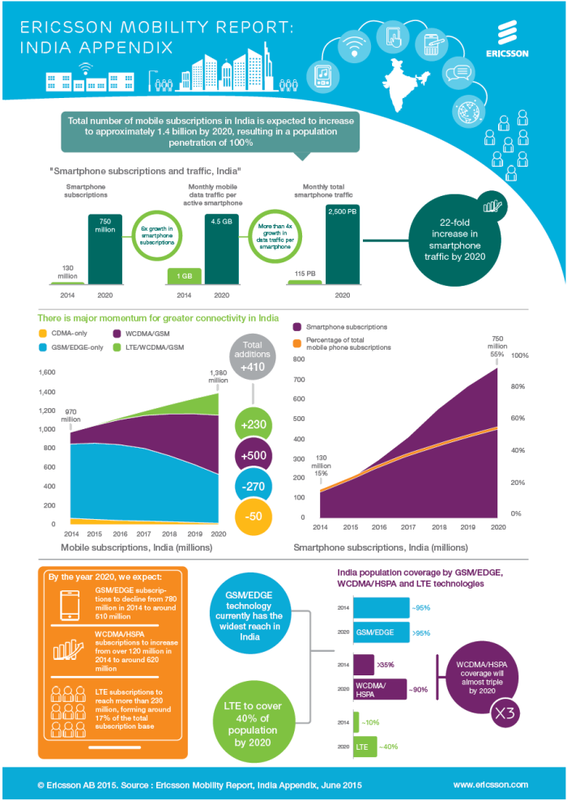 Check out this infograph on India's Mobile connectivity explosion. Data, data everywhere, but ANALYTICS needed to think! Through 2020, the overall labor force (in Western economies) will remain relatively stagnant, as will the physical assets owned and managed across nearly every industry. With such a radical shift in the digit-to-widget ratio of an organization, the management teams that win will be those that can make sense of the explosion of information in and around their businesses. 'It is not information overload. It is filter failure.' That filter is advanced ANALYTICS -- which will stand at the center of leading business models. The power of disruptive business models --such as those pioneered by Wikipedia, Facebook, Apple, Netflix, Amazon, Google, etc. -- originates from managing SMAC technologies as an integrated stack and fundamentally enabling business models by using this integrated technology stack. 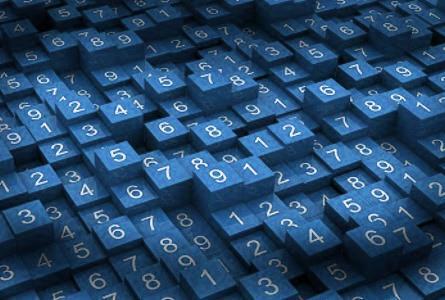 With such a radical shift in the digit-to-widget ratio of an organization, the management teams that win will be those that can make sense of the explosion of information in and around their businesses.